(CNET) When it comes to heart attack rates, Scotland appears very high in the charts. However, sometimes it takes awhile for a nation's diet to begin to counter its habits. At one Scottish school, indeed, it took a 9-year-old girl to write a blog describing, among other things, how some dishes at her school occasionally included hair. Martha Payne's blog, Never Seconds, is a litany of well, solicitude. For each school meal, she offers a Food-o-meter rating (how much she likes it), a mouthful count, a healthy rating and a number for how many pieces of hair were in the food. She only began the blog in April - and then her camera let her down, so she couldn't take pictures. And yet as Grist.org reports that as soon as the vast lens of publicity shone upon her, her school panicked. "They're a wee bit small and sometimes they're not very nice either," she told the BBC about her school dinners. But this wasn't all. "Sometimes they don't stick to the menu." Gosh, what kind of restaurant is poor Martha dining in? One that British campaigner (and sometime lucrative spokesperson for a large supermarket) Jamie Oliver finds troubling. For he offered a tweet of support to Martha's dad, Dave. He tweeted the words "shocking" and "inspirational." "You don't really get much vegetables," Martha explained to the BBC. Initially, the local education district insisted to the BBC that Martha's blog was somewhat selective. It insisted that fruit and, indeed, vegetables were plentiful. 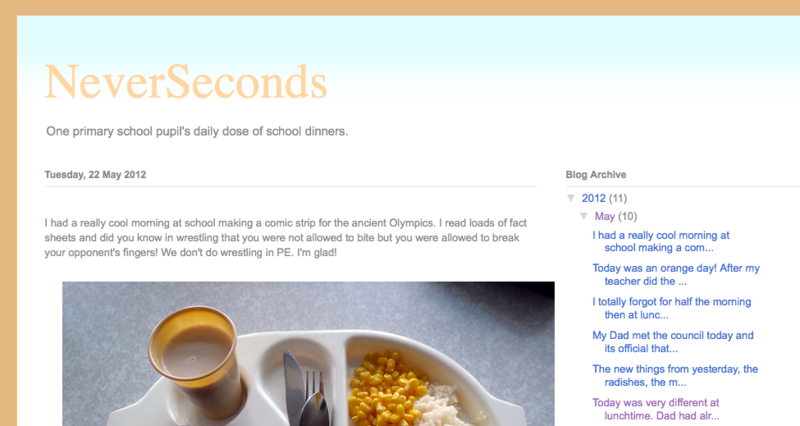 Moreover, there were only four pictures on this blog at the time and the school serves millions. However, by May 15, the dark shadow of public shame was threatening the school. For Martha blogged that people from the local council had come along with journalists in tow. Yes, the dreaded journalists. She said there was a new system for ordering food. And - lo and behold, she claimed - there appeared "cherry tomatoes, radishes, carrot and cucumber shreddings." And what did she eat? "Macaroni cheese, mashed potato, cucumber and peppers." So today we have learned that the power of publicity is very strong. And if you want to get something done you have to get noticed. You have to blog about it. Tomorrow, I shall attempt the Martha Method by blogging for automatic jail for all cyclists who don't stop at stop signs, the eradication of the word "rococo" because I just can't stand it, and for all celebrity chefs to come to my house in turns to teach me to cook properly.